Tennis legend Martina Navratilova said, "Labels are for filing, labels are for clothing, labels are not for people." In my experience, most people overvalue what they are not and undervalue what they are. We tend to focus too much on job titles and qualifications, and not enough on the impact we make on the lives of others. At my first lecture at Business School, my Professor, Manfred Kets de Vries, said to the class, "If you know what makes people mad, sad and glad and then can consistently make them glad, then you don’t need an MBA." The fact is that even the greatest experts don’t know it all. 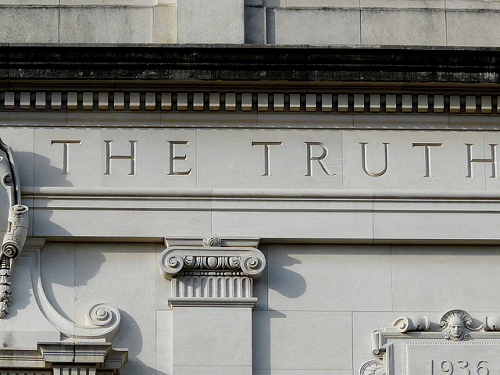 No one has a monopoly on the truth. Life changes for the better when we realize that we don’t have to know everything and we don’t have to pretend we do. Its when are hearts and minds are open that opportunities enter. The truth is that we’re far more compelling than our job descriptions and our Bio’s. When we choose to peel away some of these generalisations, kiss goodbye to the labels we’ve been given and instead project our passion for what we do and why we do it, we attract all the people, resources and opportunities we need to succeed. This year someone will choose to let go of their past, rewire their present and rewrite their future. This year someone will choose to turn pain into power, fear into fortune and confusion into clarity. This year someone will choose to trust themselves, take bigger risks and be so good that they can’t be ignored. The question is not so much can you, but will you? Make every day this year chooseday. A husband had just finished reading a new book entitled, “You Can Be The Man Of Your House." After dinner, you are going to go upstairs with me and make love to me in the manner of my choosing. Afterwards, you are going to run me a relaxing bath, wash my back and towel me dry. Then, you will massage my feet and hands …… and tomorrow, guess who’s going to dress me and comb my hair?" “The funeral director," his wife replied. This entry was posted by admin on January 11, 2015 at 6:50 am, and is filled under Sunil Bali, The Art of Awesome Living, The Book of Awesome Humour. Follow any responses to this post through RSS 2.0. Both comments and pings are currently closed.